Sleek, fine-boned, strong, energetic and highly intelligent; red foxes really are incredible creatures. And in the countryside, hunting with dogs and, latterly, other forms of persecution have ensured that foxes have remained wild and relatively unapproachable. Foxes - themselves members of the dog family - are relatively small creatures, not much bigger than a small Collie dog, and with strong but very slender legs. In fact, it’s something of a puzzle that foxes ever had the speed and stamina to evade the hunt, although they can apparently reach speeds of 30 miles per hour. Coat colour varies. Typically a rich, reddish-brown, some foxes, though, are sandy-coloured, whilst others are considerably darker than normal. A white neck and belly are typical and so is white around the nose and upper lip. The tail is long, thick and bushy with, in some individuals, a conspicuous white tip. Dark 'socks' on the lower legs are usually present, and the backs of the pointed, erect ears are also usually dark in colour. Dogs and vixens are hard to tell apart, but if a good view is available during the winter breeding season, dog foxes' testes may be noticed, whilst in spring, lactating vixens' teats may be seen. Markings may, however, differ from animal to animal, which is a useful feature for anybody who wants to identify individuals amongst the local fox population. Look out for variable extents of white on the chin, throat and chest; an optional, sometimes conspicuously white, sometimes dark, tip to the tail; and differently coloured lower legs – some dark, some not. Territories are jealously guarded, and physical battles do occur, particular during the mating season and when young of the year are dispersing and attempting to claim their own territories. Scent marking, strategically placed droppings and night-time calls are, however, often enough to deter interlopers. Although usually seen singly, at least some foxes lead relatively complex social lives. Some dogs and vixens form a pair that may last for life, although outside the breeding season, contact may be infrequent, and dog foxes, in particular, may wander in search of other matings. Then in well-studied urban areas with high fox populations, the animals have been found to live in social groups within which only a dominant pair usually breed, but others help to catch food on which to feed the cubs. Longevity is highly variable and is clearly influenced by the amount of persecution suffered at the hands of man. In captivity, foxes have a lifespan comparable to domestic dogs, that is, around 14 years, whereas in the wild, life expectancy is considerably less and in the countryside may not be much more than a couple of years. Fox diet is made up of just about anything edible: mice, voles, rats, rabbits, hedgehogs, birds and their eggs and young, earthworms, fruit and berries, and probably much more. In the New Forest, however, foxes also take grey squirrels, although catching squirrels on the ground must surely be a challenge to the foxes' patience, speed, agility and cunning. New Forest foxes also eat large numbers of dung beetles, and other types of beetle, making up for a relative shortage of rats, mice and voles - grazing pressure from deer and commoners’ stock greatly reduces the ground cover needed to support significant small mammal populations. (Here, beetles have an odd, almost mutually beneficial relationship with the foxes, for dung beetles can sometimes be seen pulling fox droppings, containing beetle wing cases, down into their burrows to provision the next generation of newly hatched beetles. And equally oddly, it is not only beetles that make use of fox dung, for purple emperor butterflies - scarce nationally and very rarely sighted in the New Forest - are known to feed on these and many other, to us, horribly undesirable foodstuffs). 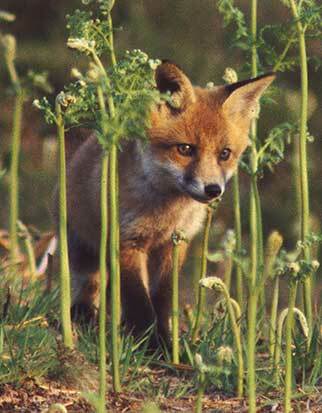 Fox senses – hearing, eyesight and smell - are extremely well-developed as befits an animal that has long been hunted. Foxes, however, will not necessarily flee at the sight of humans, but do so only when they feel threatened, which often is when they realise that they have been noticed - I've on occasion noticed a stationary fox in woodland calmly standing, waiting, watching me passing along a ride only for it to quickly move off when it has realised it's been seen. Although typically active at dawn, dusk and through the night, in quieter places it’s not unusual to encounter a fox in daylight, particularly in winter, padding along a favourite woodland ride, stopping every few paces to listen, to stare down, to nose amongst the grass, to pounce on unfortunate prey items, and scent-mark prominent objects. In fact, when there are young in the den, adult foxes will sometimes emerge in the middle of the day, stretch and then either return underground or wander off, presumably keen to take a break from the youngsters. 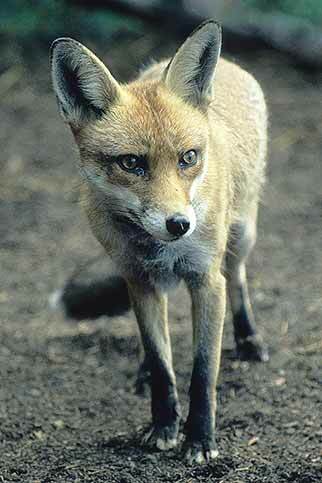 Night-time vocalisations sometimes betray fox presence. The ‘vixen's scream’, a series of eerie shrieks, can be heard intermittently throughout the year, whilst breeding season territorial sounds are heard most often from December to February. The two most common fox sounds: a mid-tone ‘wow-wow-wow’ bark and a fearsome ‘waaaaaaaa’, sometimes given by a stationary animal but also given on the move, allowing nocturnal passage through the woods to easily be followed. But evidence of a fox’s passing is more often encountered than the fox. Fox scent marking sometimes leaves a lingering, strongly musky, pungent aroma that is readily discernable to the human nose, whilst fox paw prints may occasionally be noticed - they are quite small and typically narrower than those of dogs. Prey remains, too, can frequently be seen, strewn about the woodland floor or along woodland rides, whilst fox droppings are distinctive and often deposited on prominent objects as territorial markers.